There is a misconception amongst men that they should rent a tuxedo instead of buying one as very few men actually own one. Buying a tuxedo may sound expensive but, renting a tuxedo for about three times sums up to the actual cost of a brand new tuxedo. The purchase of a tuxedo is a worthy suggestion as it can be used at anytime without having to rent one for every occasion. Buying your own tux is always a great feeling. You will always feel happy to wear it as the hygienic part is taken care of. You can change its appearance to suit the latest trends by accessorizing it. A basic black tuxedo is by far the most common and accepted form of tuxedo. There are various types or styles of button patterns or lapels. Single-breasted with one button and double-breasted with two buttons are the most common and the simplest. But, these days, up to four buttons are offered in both single and double-breasted suits by designers like Calvin Klein, Fiorelli, Perry Ellis and Tommy Hilfiger for the extra style quotient. Pants ought to be uncuffed at the bottom and made to have a silk or a nylon strip down the side. It is always considered as the best option to choose the tuxedo first and then try experimenting with a wide range of tuxedo formal wear accessories. But, as far as the accessories are concerned, many can be found as vests, cummerbunds, bow-ties, etc. It is always considered a better option to go in for lighter clothing. So, always choose a tuxedo of modern design, which is made up of a lightweight material. A lot of older tuxedos are usually hard to handle and deal with during formal affairs, as they are made up of heavier material. Always keep in mind that you will be wearing your tuxedo all night long and may possibly do a little bit of dancing too. So, the lighter the better. Always try to stick to the basics. Do not go in for a tuxedo that is not black or dark blue even if they appear to be intriguing. Black and dark blue are the two standard and common colors that can be worn on any occasion. Also, be aware, that you will always stand out in a crowd if you opt to go for a different color, such as a white tuxedo. Learn to coordinate. Your jacket needs to be complimented by the pants that you choose to wear. Choose pants that have stripes if you intend on wearing a jacket with tailcoats. Pants having a single stripe should be made to align with all other jackets. Be sure that you know what kind of jacket you are buying. A cummerbund is always required by a single-breasted jacket and is worn open whereas a double-breasted jacket is worn buttoned when standing. 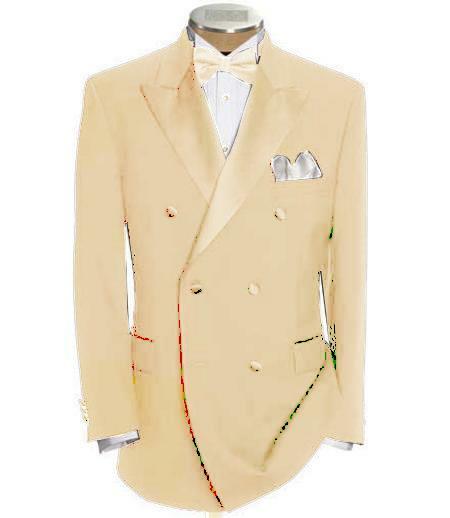 Make it a point to examine properly the tuxedo that you purchase, just like you would do for anything else. You can get a great bargain if you opt for buying a tuxedo that has been retired from going on for rentals. However, you wouldn't want to buy a tuxedo that probably has a hole in it or is terribly worn out. These are some features in men's formal wear that need to be given prime importance. If worn in the right way, men's formal wear can truly make a lasting impression. You can also get some great tips and pointers from image consultants who will help you in recommending items for your wardrobe and providing you a personal shopper service. Assuring satisfaction, our unconditional return policy is available only on unworn and unused items purchased. Products returned must come with their original packing and labels. Upon the delivery of item, the full purchase price minus the 0% Restocking Fee will be refunded. Shipping fees are not refunded. Irrespective of the reason you are dissatisfied with the purchase, the item should be returned within15 days after the purchase, if not we shall deem that you are satisfied with your purchase and the sale will become final thereafter. On the other hand, if we have mistakenly changed the item, then we shall reimburse the full amount paid plus return shipping cost (Christmas merchandise purchased from November 15th to December 29th can be exchanged up to January 25th). Customer satisfaction being our priority, we improve our product quality standards and customer service at a regular basis. If at all, you are not satisfied with the item purchased, or it does not fit, you can send it back and we will refund the amount within 7 days after the delivery of the returned item. www.mensitaly.com © 2016 All Rights Reserved.